Finally, there is a book about the abuses of innocent animals for whom...well, we will spare you all of the ugly details. What we will state is that it is with grace, mercy and a call to action that this book was written. In the past, we have always stayed away from such literature as it simply haunts us. We cannot handle it. We will always be grateful for the activist's out there who are fighting where the weak of us simply flail and sob in our inability to be able to handle the epitome of senseless brutality of others. However, Striking at the Roots knows that there are sensate's out there. They know that there is reading universe comprised of the young, the sensitive, the incapable. "Here!" When we began reading, we twitched, we grimaced, we waited for the stuff that cripples. It was then that we discovered that Author Mark Hawthorne knew in advance about us. We could just skip over the hard stuff and we did. We had too. But, Appendix B took care of that. We skipped right to it and know how we can help. We can be a voice without knowing all of the gritty details. We can help. 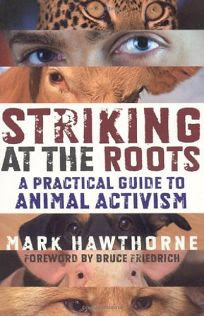 Mark Hawthorne is the author of three books on animal rights (all from Changemakers Books): "Bleating Hearts: The Hidden World of Animal Suffering," which examines the many ways humans exploit nonhumans; "A Vegan Ethic: Embracing a Life of Compassion Toward All"; and "Striking at the Roots: A Practical Guide to Animal Activism," which empowers people around the world to get active for animals and will be released as a thoroughly revised 10th-anniversary edition in November of 2018. Mark stopped eating meat after an encounter with one of India's many cows in 1992 and became an ethical vegan a decade later. His writing has also been featured in "Vegan's Daily Companion" (Quarry Books) and in the anthologies "Uncaged: Top Activists Share Their Wisdom on Effective Farm Animal Advocacy" (Ben Davidow), "Turning Points in Compassion: Personal Journeys of Animal Advocates" (SpiritWings), and "Stories to Live By: Wisdom to Help You Make the Most of Every Day" (Travelers' Tales). Mark is a frequent contributor to vegan magazines.